2 Bottles Clam Juice, 8 oz. 3 Cans Baby Clams, 10 oz. 2 Cans Chicken Broth, 14.5 oz. Cut bacon into 1/2″ pieces. Rinse leek under cold water; cut off root end and slice in half. Cut into 1/2″ pieces. Rinse celery and cut into 1/2″ pieces. Clean garlic and mince finely. Clean onion and dice. Clean carrots and cut into 1/2″ pieces. Wash and cube potatoes; no need to peel if you are using red or yellow potatoes. In a large stock pot, brown the bacon over medium high heat. Remove from pot with slotted spoon and set aside. To the drippings in the pot, add the butter and melt. Add the leek, onion, celery and garlic. Cook and stir for 10 to 12 minutes. Add the potatoes and carrots. Cook and stir for 5 minutes longer. Add the chicken broth, clam juice and liquid smoke. Bring to a boil and turn heat to medium. Cook, stirring occasionally, for 30 minutes or until vegetables are tender. Meanwhile, in a medium bowl, combine the flour and milk. Whisk well so that no lumps remain. Add to the broth and stir until slightly thickened. Stir in drained clams. Turn heat to low and cook, stirring frequently, for 12 to 15 minutes. 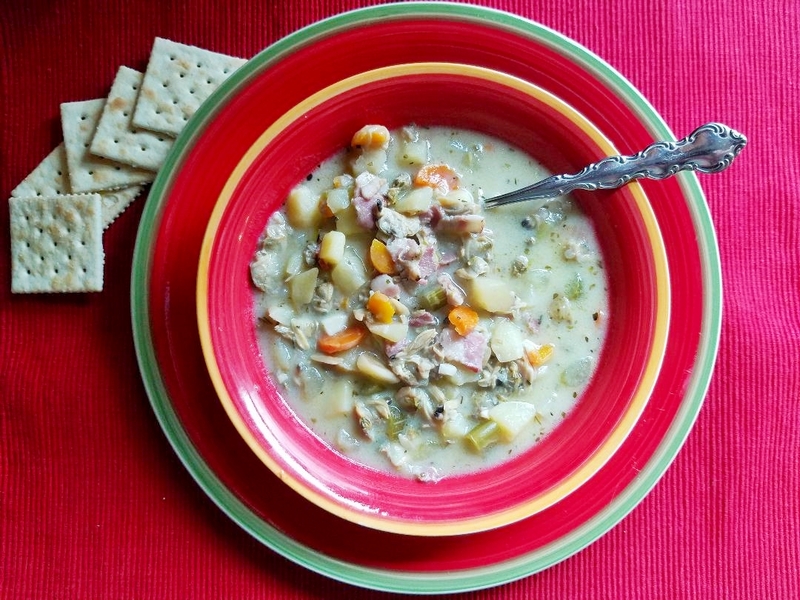 Easy New England Clam Chowder is the soup of the season! Creamy and delicious; prepare this main dish meal in a little over an hour for a hearty meal on a cold fall night!